If you're like me, you have some leftover cardboard boxes from the holidays, courtesy of Amazon. I love coming up with ideas to utilize this humble material. I think it makes a great canvas for a variety of projects. And there is something so satisying about creating "something" from "nothing". 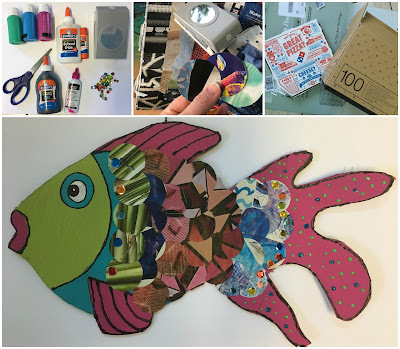 Once cut out with an X-acto knife, this tropical fish was created using some craft acrylics and magazine pages with a 2 inch circle punch for colorful scales. I raided my craft closet and used various materials to add some extra punch: puff, paint, sequins and glue combined with black paint for outlining. You could use whatever you have on hand. I glued some twine to the back so it could be hung. 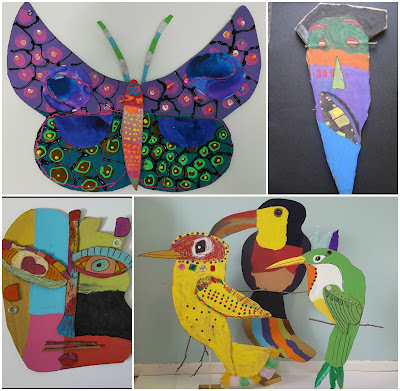 This would be a great project to do with the kids over the rest of your winter break.